"Cool down to the relaxing sound of an electric fan. 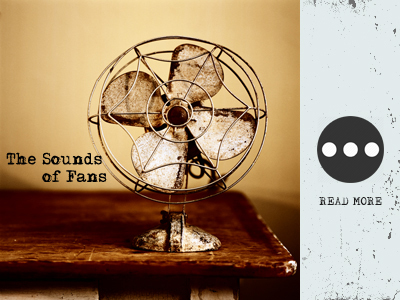 The Sounds of Fans CD is a collection of high quality recordings of fan sounds. Each fan was recorded in carefully selected environments and range from vintage to modern, small to large, and even rusty antique fans. Over 70 minutes of fan sounds! Each track averages 10 minutes in length, with some tracks capturing the aura of the surroundings, such as the country sounds of a front porch in the summertime or a thunderstorm brewing in the distance. Great for relaxation and guaranteed to blow you away!"